The timing of the attack on a Church in provincial capital of Khyber Pakht unekhwa province of Pakistan is very significant. The attackers have chosen the day when Pakistani Prime Minister Muhammad Nawaz Sharif had to fly to New York to attend United Nations General Assembly summit. The attackers saw him off to New York with a bloody image of his country. The attack will haunt the Prime Minister throughout his visit. It was not just an isolated occasional attack. Rather it involved deep planning with strategic results in sight. The planners seem aware of the sever reaction by the Christian community which has been protesting the attack all over the country as well as the pressure Pakistan will have to face at domestic and international level to launch another military operation to root out militancy. 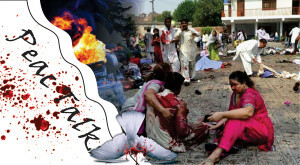 Police official has said that on Sunday September 22, 2013, two suicide bombers detonated themselves up in All Saints Church in Peshawar killing at least 78 people including 34 women and 7 children while at least 110 people were injured in the tragic incident. The attack was condemned by all segment of life and three days of national mourning is also announced. Political leaders and others are showing up their support to Christian minority but the wound will take longer time to heal as it was deadliest ever attack on any Christianity related target in the country. Like many other ironies attached with war-on-terror, the worship places of different religions in the Afghanistan and Pakistan regularly come under attack. It was started with U.S. cruise missiles targeting mosques in Afghanistan and then U.S. drone attacks on mosques and Madrassas in Pakistan’s tribal belt. The legacy of targeting warship places is also shared by religiously motivated militant groups. Except Hindu temples, almost all religious places have been targeted during past twelve years. Many mosques and Madrassas were also destroyed during military operations by Pakistani armed forces in Swat and FATA. Who is behind the attack on the Church in Peshawar is a million dollar question. A sectarian militant group Jundullah has claimed responsibility of the Sunday attack on Church in Peshawar. However, major anti-state militant group Tehreek-e-Taliban has denied its involvement in the attack. The attack occurred on the next day of a stunning revelation by an Indian newspaper Hindustan Times that the military intelligence unit set up by former Indian Army Chief General VK Singh was involved in terror activities in Pakistan. General perception is that Indian intelligence is involved in promoting anti-state violence in Pakistan. The Indian consulates in Afghan cities close to Pakistani border are blamed for masterminding the ongoing insurgency in Pakistan. Despite these allegations and accusations, Pakistan has failed to present any official proofs of Indian involvement in the covert operations in Pakistan which shows the ‘competence’ of its intelligence apparatus. The revelation by an Indian newspaper puts Indian journalists at par with Pakistan’s intelligence officers who failed to provide any concrete evidence to Pakistani government regarding Indian involvement in terrorism in Pakistan. Currently Pakistani citizens are facing dirty war of intelligence agencies of different countries active in the region. Pakistani intelligence agencies are under constant pressure to counter subversive activities of regional and extra regional intelligence networks. Al-Qaeda and Pakistan’s nuclear program are the prime motives of extra-regional intelligence networks while traditional rivalry with India and covert and counter intelligence operations against each other is not a secret anymore. The current wave of attack was imminent as there are players active in the region who do not want Pakistan to negotiate a peace deal with its own people fighting against the state in FATA. The perception in Pakistan’s armed forces is also negative regarding dialogue with Pakistani Taliban as the military does not want to accept TTP as a stake holder and a party to the conflict. It fears that any direct talks with TTP will give the militant group an undue legitimacy and the pause in military actions against the militants may give them ample time to regroup and reorganize their fading capabilities. (However, the attacks on an Army general and Church in Peshawar are not examples of ‘fading capabilities’.) Pakistan’s secularists are also against negotiations with Taliban. Prime Minister Sharif’s reaction to the Church attack was like life line for those who are against any kind of negotiations with Pakistani Taliban. He said that it looks difficult that government’s desire to negotiate with Taliban will further proceed. After the Sunday attack he will become under pressure to alter his approach of peacefully ending the conflict. Al-Qaeda affiliates have not just targeted a Church in Pakistan on Sunday. It looks Al-Qaeda was masterminding special Sunday attacks in three major countries. A suicide attack in Iraq and an attack on a shopping mall in Nairobi were also grabbing international headlines. If we look back to the era prior to global war-on-terror, we find the world was a better place to live.